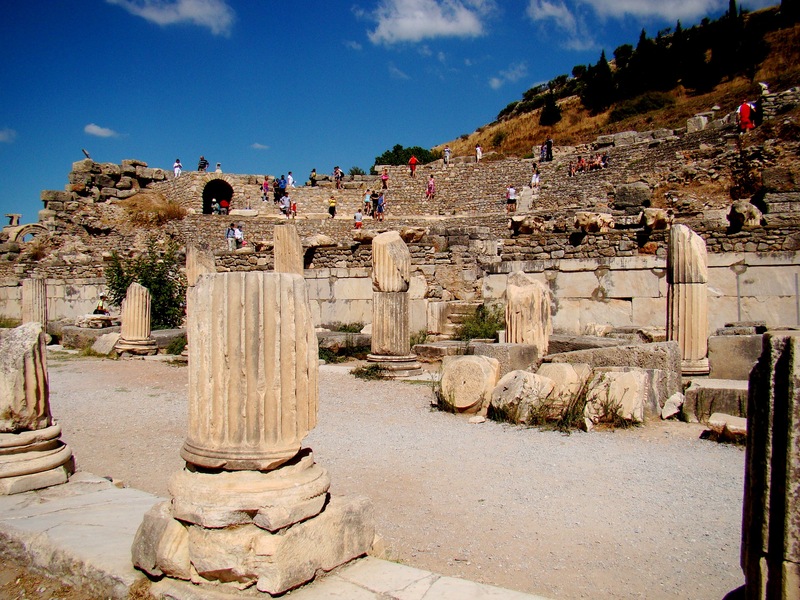 Ephesus which was established as a port, used to be the most important commercial or trade centre of the ancient world due to its very fertile valley and its strategic location. It was definitely a magnificent city during its prime and was filled with many important structures. The ruins to the east of the Basilica belong to the bath of Varius, dating to the Roman period. 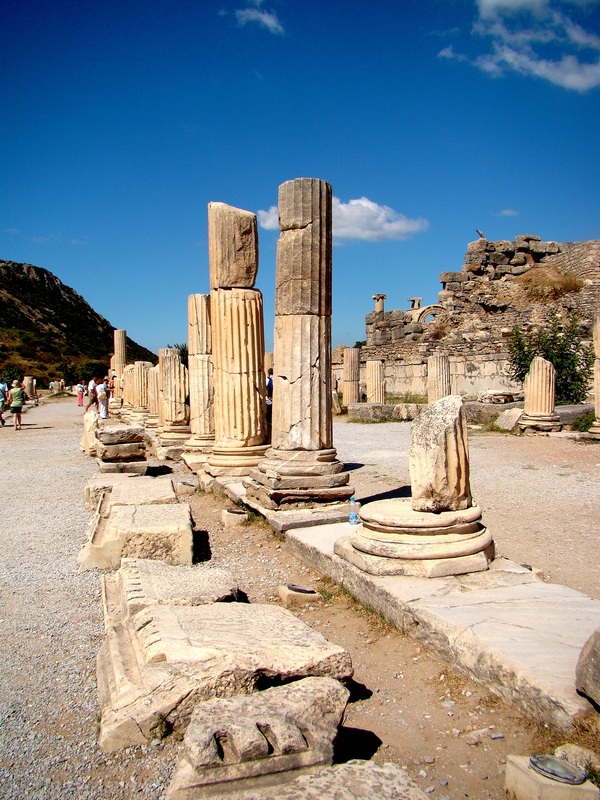 The city was not only famed for the Temple of Artemis or the Library of Celsus but also for its theater which was capable of holding 25,000 spectators. 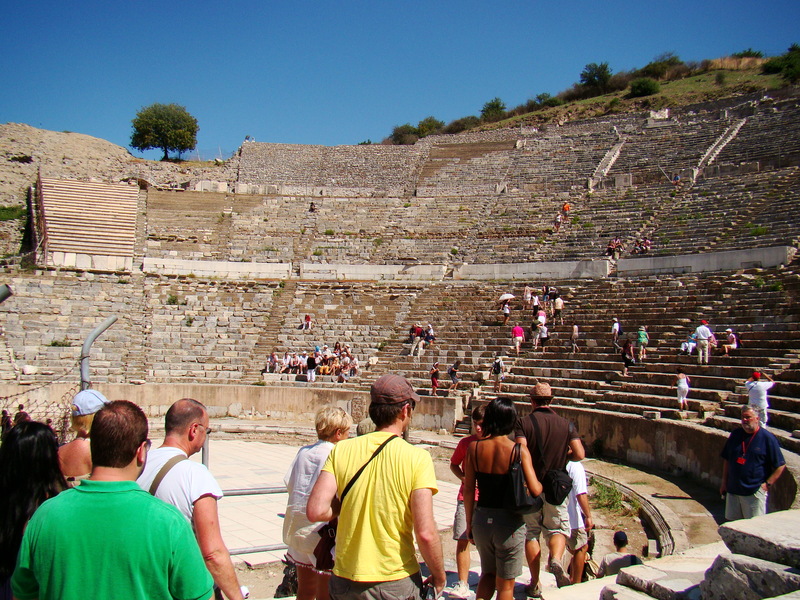 This Theater is believed to be the largest outdoor theater of the ancient world. The Great Theater, is a dramatic and impressive sight. 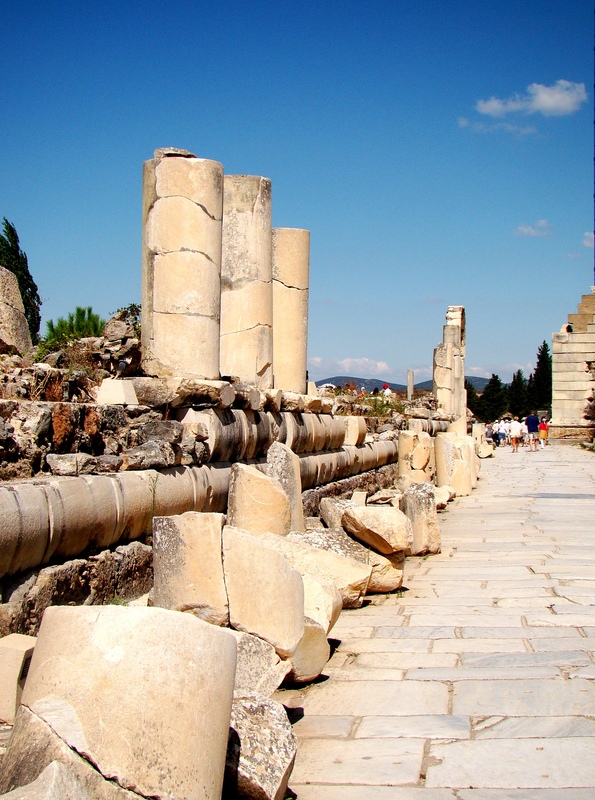 It is the road starting form the great theatre to the Celsus Library, which is the portion of the sacred way that leads past Panayirdagi to the Temple of Artemis. The agora on the southern part of the Basilica is the State Agora, and was built in the Roman Period in the first century B.C. This agora was used not for commerce but for business, it played an important role as a meeting place for the governmental discussions. This Outdoor Theater, built on the slopes of Mount Panayir, was constructed during the reign of Lysimachos. Like all the other ancient theatres, the theatre consisted of three main sections: the skene (stage building) , the orchestra ( place of action for the actors) and the cavea (auditorium) where the audience sat. Of the skene, which was approximately 18 meters high, only pieces remain. The theatrical productions in the classical period were performed by male actors who wore masks on their faces. These and other elements related to the social life in Ephesus during its period of greatest splendour have been inferred from the frescoes decorating several walls of the so-called Houses on the slope. This Great Theater was used initially for drama performances, but during later Roman times gladiatorial combats were also held on its stage. The first archaeological evidence of a gladiator graveyard was found in May 2007. It must have been an amazing sight having around 25 000 people watching Gladiators fight to the death in this beautiful valley. The auditorium is actually still used today for seating the public during the performances in this theatre. This Outdoor Theater is arranged in three large semi-circles broken-up by eleven wedges of steps separated by entrance staircases. The original theatre could seat about 25 000 and the auditorium originally rose for at least 30 meters over the orchestra, crowned at the summit by a porticoed structure which had the function of further improving the acoustics in the complex. There are magnificent views to be had from the top. Most of the marble paving and some lower elements of the backdrop remain on the stage. The cavea has sixty six rows of seats, divided by two diazoma (walkway between seats) into three horizontal sections. There are three sections of seats. In the lower section, Marble pieces, used for restoration, and the Emperor’s Box were found. The seats with backs ,made of marble, were reserved for important people. The audience entered from the upper cavea. 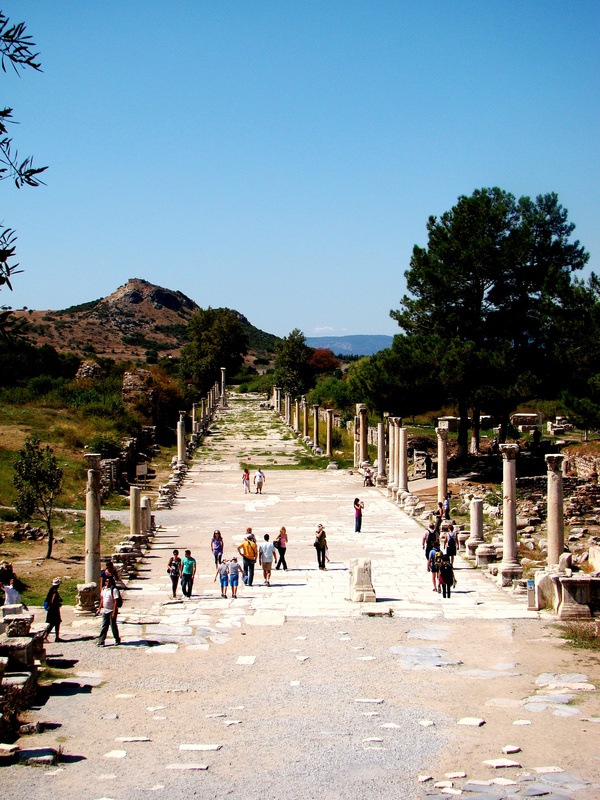 It is one of the three main streets of Ephesus between The Hercules Gate till to the Celsus Library. 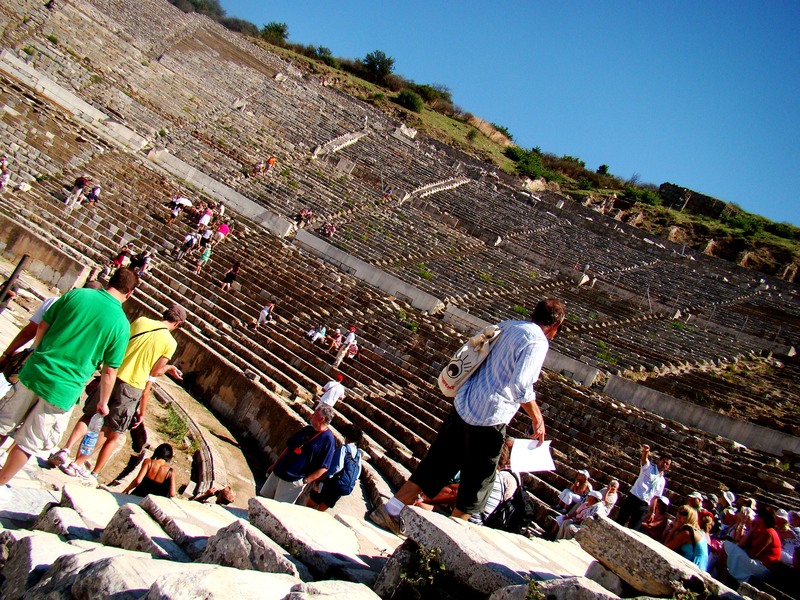 Today, the theater is restored and is put to use every May during the Selçuk Ephesus Festival of Culture and Art. Hadrian’s Gate is located at the junction of the Curetes Street and the Marble Street. Thank you for that lovely compliment Lu! What an amazing place! Great photos;) Have a very Happy New Year! Thank you Mara Lee. Hope you had a lovely festive season and a very Happy New Year!! Thank you! 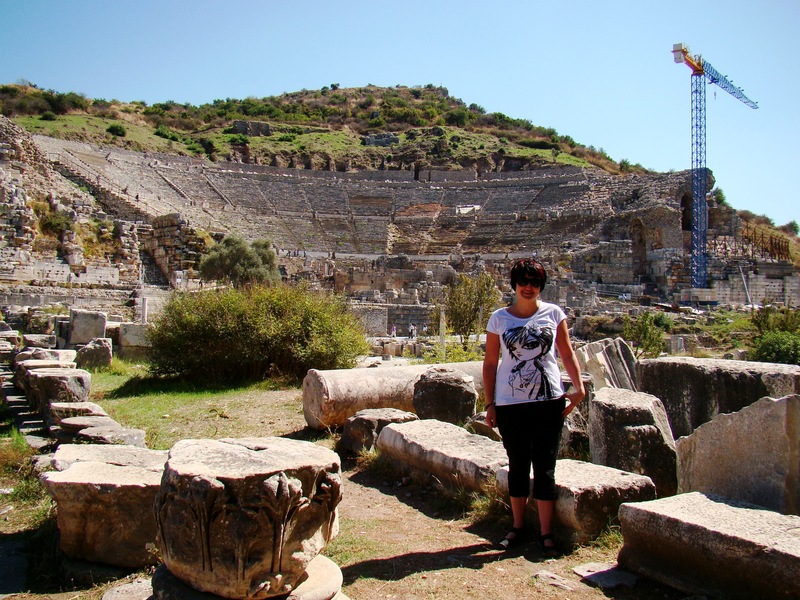 Ephesus was definitely one of the highlights of my Turkey adventure. Oh! To travel with you as a guide as you do on your posts would ease my troubled mind. Thank you for letting us come along for the ride. Peace! Thank yoiu for that lovely compliment! I have played guide to my parents on a couple of trips and they seemed to enjoy it a lot. Wonderful post Janaline. Ephesus was the highlight of our Turkey trip, but the crowds were a bit off-putting. Thanks Madhu! Unfortunately crowds do tend to spoil the atmosphere of these beautiful ruins. Thank you! I was playing around with my new camera and tried out al the diferent settings. Terrific article! Thanks for posting it. Thanks Mike and a big welcome to my journey!